In December 2015–January 2016, a salvage excavation was conducted southeast of the Ligad Center in Modiʽin (Permit No. A-7596; map ref. 197052–299/646643–974; Fig. 1), prior to construction. 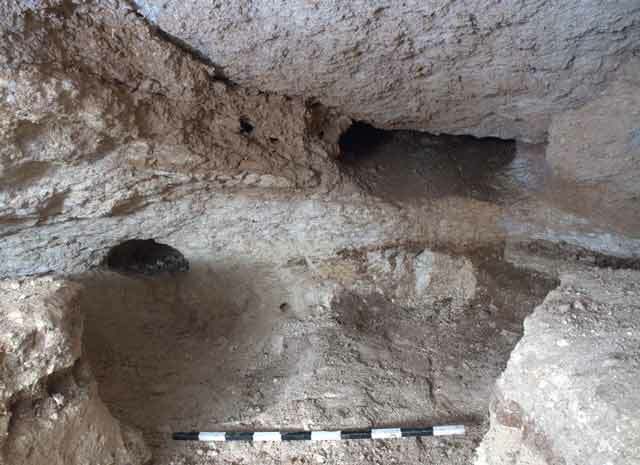 The excavation, undertaken on behalf of the Israel Antiquities Authority and financed by the Mega-Or Modiʽin Company, Ltd., was directed by A. Buchennino and I. Kornfeld (preliminary inspections), with the assistance of Y. Amrani and E. Bachar (administration), M. Kahan, M. Kunin and A. Hajian (surveying and drafting), A. Peretz (field photography), Y. Marmelstein (aerial photography), M. Shuiskaya (pottery drawing), I. Delerson (plans), Y. Barshak (photographic archive) and A. Dagot and C. Ben-Ari (GPS). 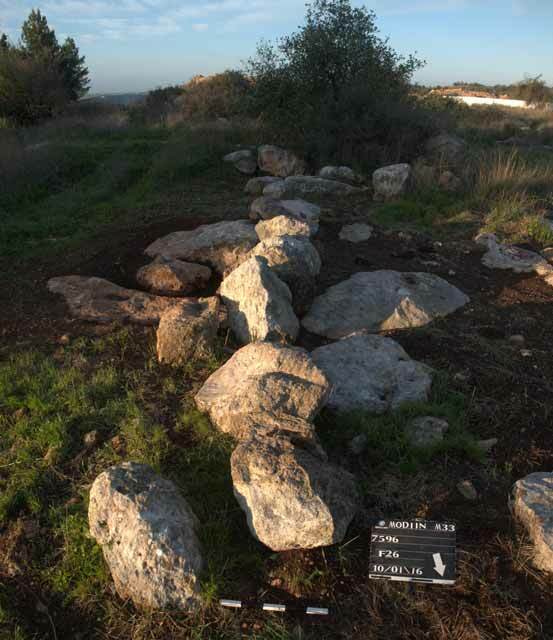 The excavation area extended over a hilly area with numerous bedrock outcrops separated by accumulations of alluvium with Mediterranean vegetation, such as carob, oak, spiny broom, Biblical-hyssop, white micromeria, cyclamens and squill. 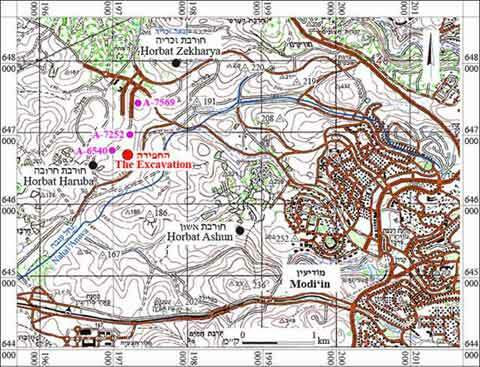 Several ancient sites are found in the immediate vicinity: Horbat Ashun in the east, Horbat Zekharya in the north and Horbat Haruba, c. 700 m southwest of the excavation area. 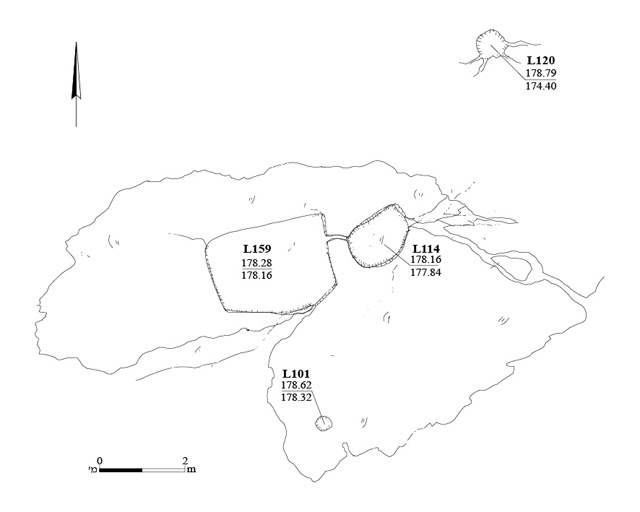 An excavation conducted northwest of the current excavation yielded remains of a building, cisterns, winepresses and a burial cave dated to the Hellenistic and Roman periods (Avner and Shabi 2013; Fig. 1: A-6540). 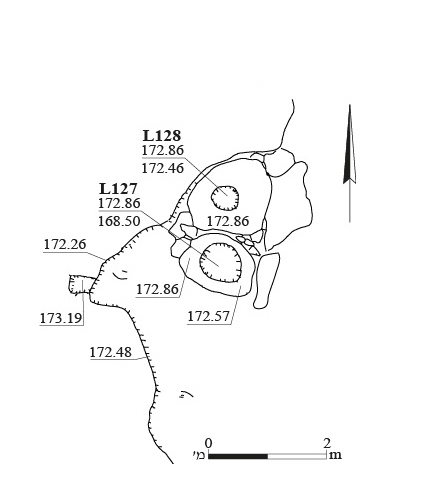 Cupmarks, a stone-clearance heap, an underground cavity (Krispin 2015; Fig. 1: A-7269) and a winepresses (Toueg 2016; Fig. 1: A-7569) were revealed in the excavations north of the area. 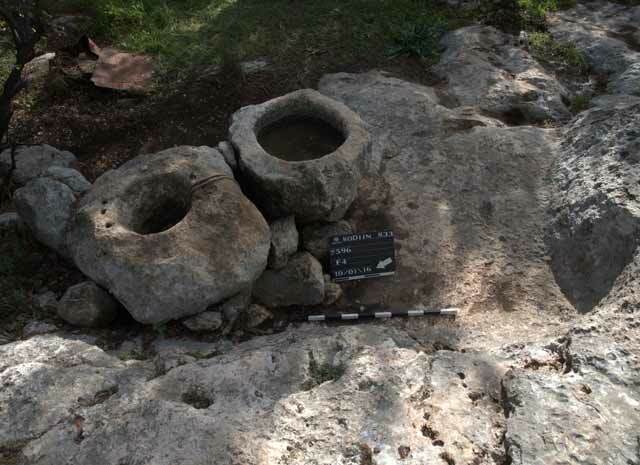 A variety of antiquities were exposed in the excavation, including seven winepresses (F7, F14, F25, F31, F33, F50, F58; Fig. 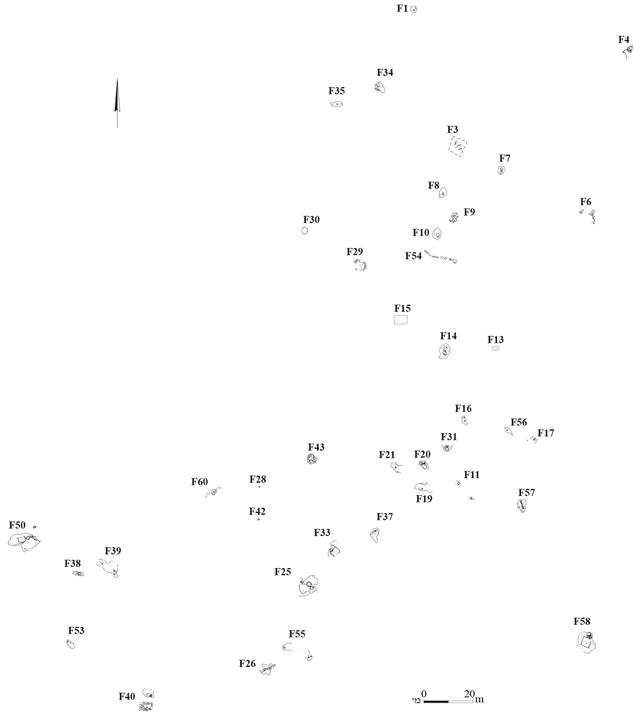 2), two bodedot (pressing installations; F38, F40), three cisterns (F4, F34, F50), a cave (F11), three field towers (F9, F29, F43), two field walls (F26, F54), a crushing basin of an oil press (F60) and c. 30 cupmarks; of the latter, several were hewn in the bedrock surfaces of installations (F14, F40, F50), and the rest were found in other bedrock outcrops, either as a single installation or in groups (F6, F8, F10, F13, F17, F19–F21, F28, F35, F37, F39, F42, F53–F55, F57). Winepresses. 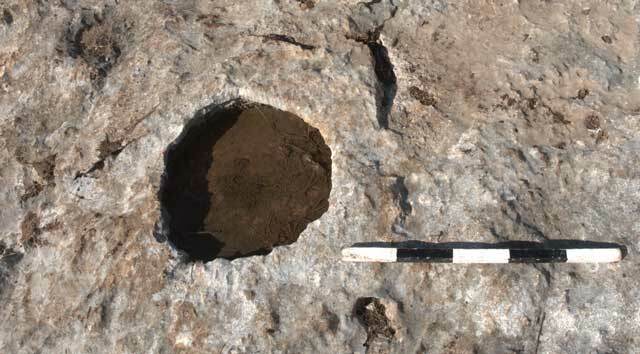 The treading floor of Winepress 7 (0.9 × 1.1 m, depth 0.15 m) was equipped with a drain in its southeastern corner, through which the must flowed to a circular collecting vat (diam. c. 1 m, depth 0.4 m). 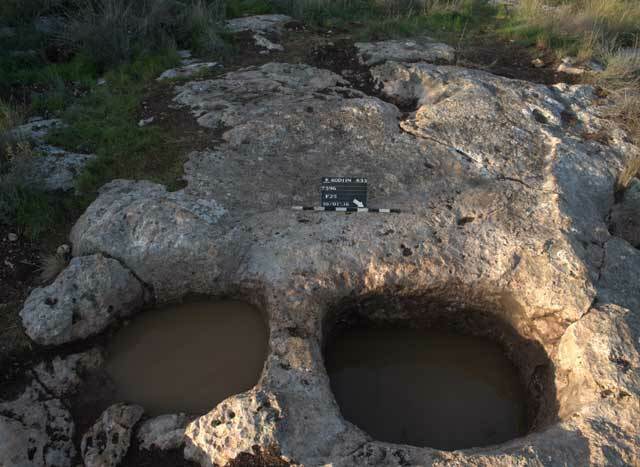 Winepress 14 had a treading floor (L136; 1.6 × 2.1 m, depth 0.2 m; Fig. 3) that sloped to the south. The must drained into a collecting vat (L137; 1.2 × 1.8 m, depth 1 m) hewn beside the central part of the southern wall. A rectangular sump (0.45 × 0.70 m, depth 0.2 m) was hewn in southeastern corner of the vat’s floor, where dirt and residue could settle. A wall apparently separated between the treading floor and the collecting vat, but it was removed at some point. A small depression in the bedrock (diam. 0.5 m, depth 0.5 m; Fig. 4) was probably part of a channel that bisected the wall and conveyed the must from the treading floor to the collecting vat. Two cupmarks (L138—diam. c. 0.4 m, depth 0.2 m; L139—diam. 0.2 m, depth 6 cm) were hewn in the treading floor; it is unclear if they predated the winepress or were hewn when it was no longer in use. 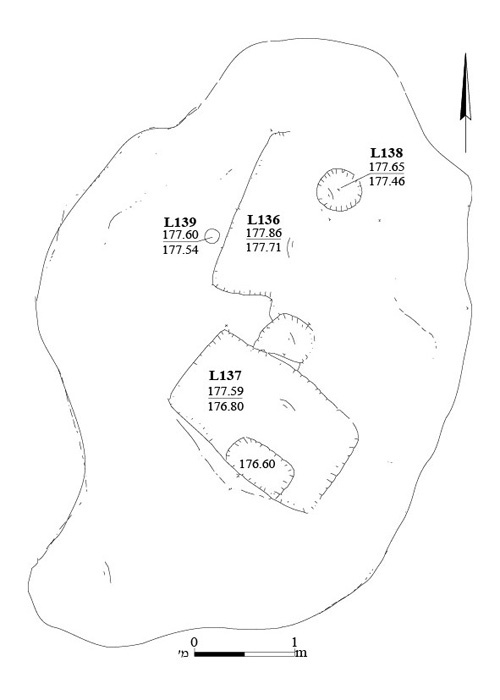 Winepress 25 had a treading floor (L111; 2.4 × 2.6 m, depth 0.25 m; Fig. 5) that sloped northward. The must drained into a filtration vat (L112; 1.05 × 1.25 m, depth 0.9 m) in the southeastern corner of the treading floor, and from there it flowed into a collecting vat (L113; 1.45 × 1.70 m, depth 1.2 m; Fig. 6) through a gutter at the top of the wall that separated the two vats. 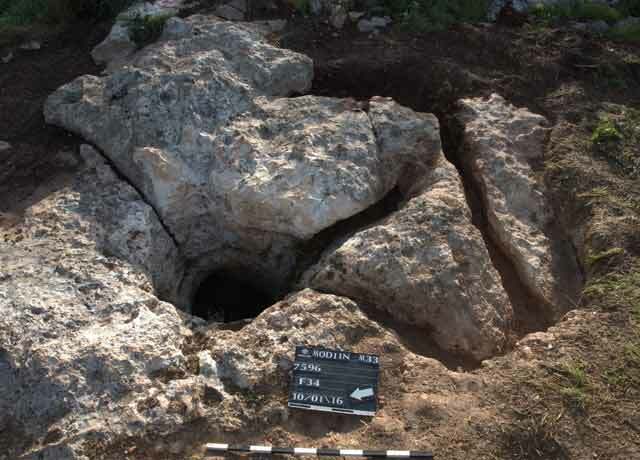 Winepress 31 had a treading floor (0.9 × 1.3 m, depth 0.25 m) that sloped northward as well. The must drained into a collecting vat (0.8 × 1.1 m, depth 0.45 m) located along the central part of the northern wall. A rectangular sump (0.15 × 0.20 m, depth 0.15 m) was hewn in the vat’s floor along the central part of its northern wall. Winepress 33 was equipped with a treading floor (2.4 × 3.4 m, depth 0.1 m) that sloped westward. The must drained into a collecting vat (diam. 1.0–1.3 m, depth 0.8 m) situated along the central part of its western wall. 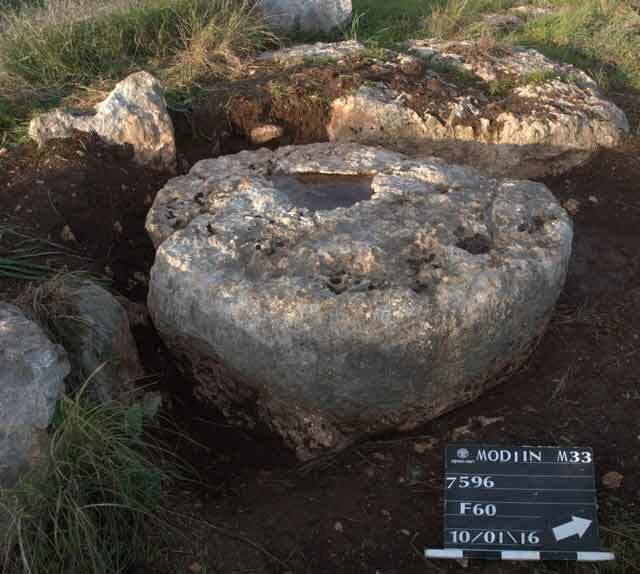 Winepress 50 had a treading floor (L159; 1.5 × 2.9 m, depth 0.3 m; Fig. 7) that sloped northward. The must flowed into an elliptical collecting vat (L114; diam. 1.15 m, depth 1.5 m) hewn along the central part of its northern wall. 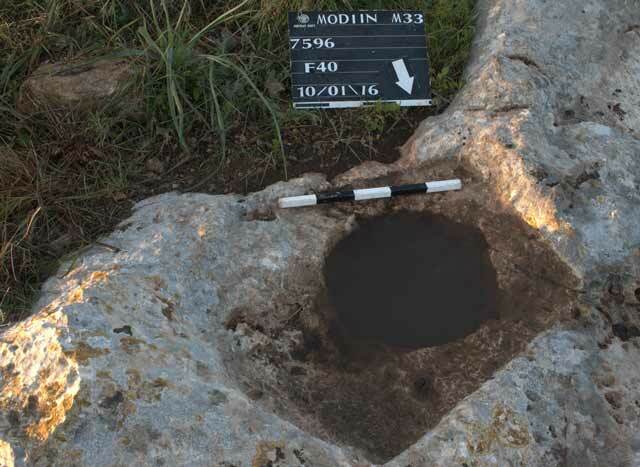 A cupmark (L101) was hewn in the southern part of the bedrock outcrop where this winepress was hewn. 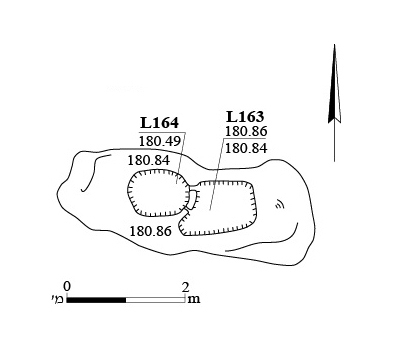 Another cupmark (L120) was located on a different rock outcrop, to its north. Winepress 58 had a square, plastered treading floor (L100; 3.4 × 3.4 m, depth 0.35 m; Figs. 8–10) that sloped northward. 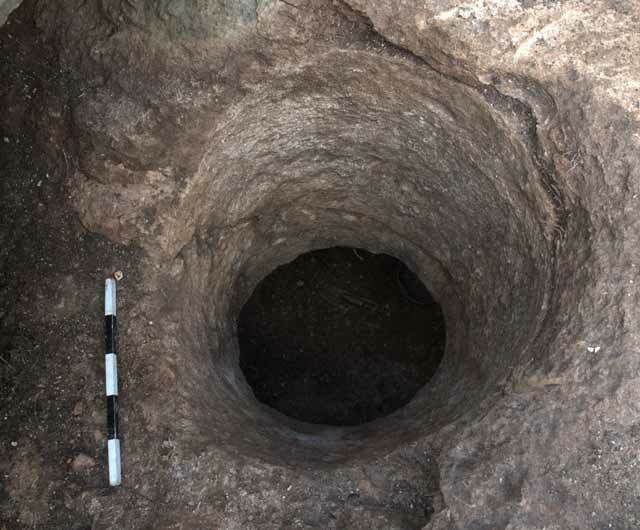 A plastered filtration vat (L109; 0.60 × 0.75 m, depth 0.33 m) was hewn near its northeastern corner; a gutter in the vat’s northern wall conveyed the clean must into a plastered collecting vat (L110; 1.2 × 1.3 m, depth 0.75 m). Bodedot. The two bodedot (F38, F40; Fig. 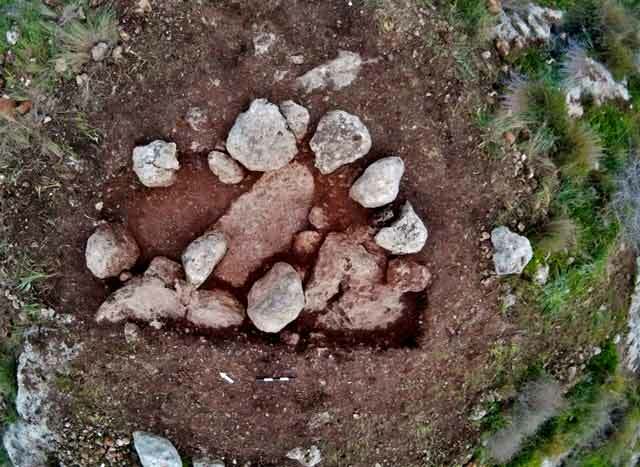 2) were unearthed in the southwest of the area. Bodeda 38 comprised a surface (L163; 0.9 × 1.1 m; Fig. 11) that drained into a basin (L164; diam. 0.9 m, depth 1 m). Bodeda 40 comprised a surface (0.8 × 1.0 m; Fig. 12) that drained into a round cupmark (diam. 0.45 m, depth 0.35 m). Cisterns. Cistern 4 was hewn in a bedrock surface (L127; diam. of opening 0.9 m; Figs. 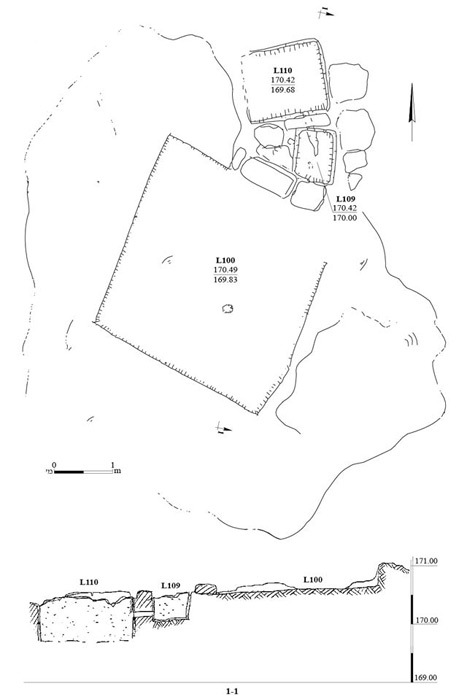 13, 14; not excavated); alongside it to the south was a basin (L128; 1.3 × 1.5 m). A rock-hewn shaft (diam. 0.9–1.2 m, depth 1.1 m; Fig. 15) led to Cistern 34 (depth 3.1 m; unexcavated). Cistern 50 (diam. 0.7 m; unexcavated) was hewn in the bedrock. Cave. A vertical shaft (L104; diam. 1.1 m, depth 1.1 m; Fig. 16) quarried through the hard nari led into a cave hewn in soft chalk. The cave was filled with alluvium, almost to its ceiling (Fig. 17), and its excavation was not completed. A rectangular rock-cutting (0.55 × 0.80 m, depth 0.7 m) was discovered c. 45 m east of the cave; its nature and relation to the cave remain unclear. Field Towers (F9, F29, F43). These were round structures constructed of fieldstones of various sizes. They were built alongside the cultivation plots and were used seasonally. Only the eastern halves of the field towers were excavated. Tower 9 seems to have opening with large stone doorjambs (Fig. 18). Field Walls. 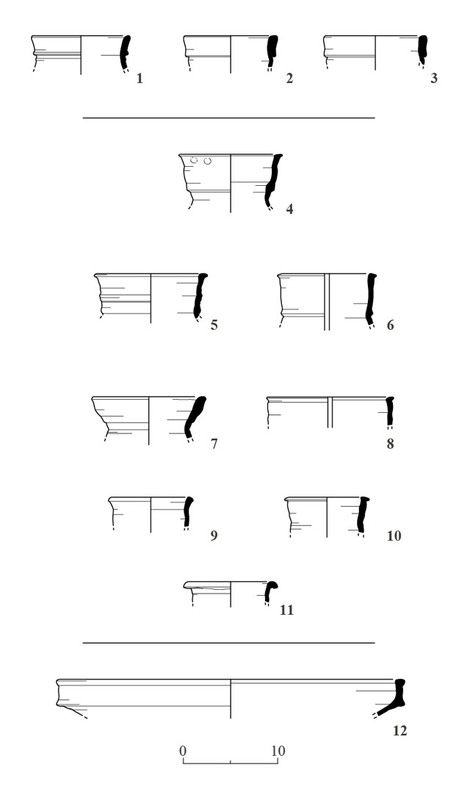 The walls (F26—length 6.8 m; F54—length 23.5 m; Fig. 19) were built of fieldstones of various sizes and founded on bedrock; they were preserved to a height of one course. Crushing Basin (F60). 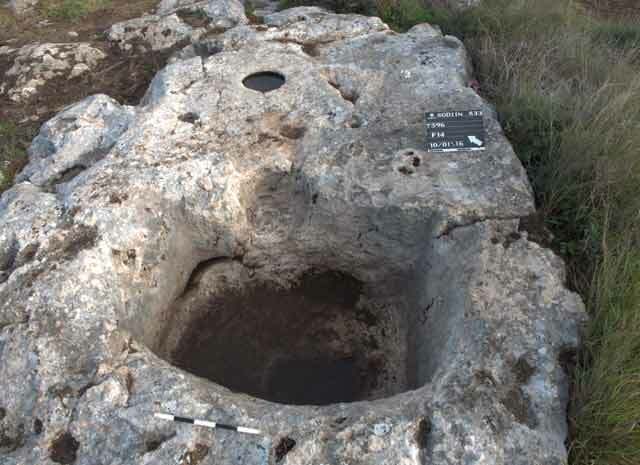 A partially quarried crushing basin for an oil press (L154; diam. 1.7 m, height 0.5 m; Fig. 20) was found. Cupmarks. Most of the cupmarks were shallow (e.g., F8, F17, F19–F21, F37, F42, F53–F55; depth 0.12–0.25 m; Fig. 21); several had a diameter larger than their depth. Other cupmarks (e.g., F10, F13, F28, F35; depth 0.3–0.7 m) were deep. It is unclear what these were used for or when they were hewn. Researchers have proposed a variety of uses for cupmarks, such as collecting rainwater, producing small amounts of olive oil, grinding and crushing or the extraction of liquids (van den Brink 2005; ‘Ad 2011; Krispin 2015). Pottery. Pottery sherds belonging to jars from the end of the Hellenistic period (Fig. 22:1–3) and to a jar from the Roman period (Fig. 22:4) were found in the accumulation in Cupmark 10. Roman-period jar fragments (Fig. 22:5–11) were found in the accumulation in Field Towers 9 and 29 and in the accumulation that covered Field Wall 26. A PRSW bowl (Fig. 22:12) from the Byzantine period (fifth–sixth centuries CE) was recovered from the accumulation in Cupmark 20. The various installations discovered in the excavation fit in well with the findings of previous excavations in the area. They attest to the agricultural activity that took place in the settlements at Horbat Haruba and Horbat Ashun, such as cultivating grapes for wine production. Apart from a few potsherds, no datable artifacts were found; nevertheless, the site should probably be ascribed to the late Hellenistic–Roman periods, based on the excavation results of agricultural installations in the vicinity and the date of the nearby ruins. 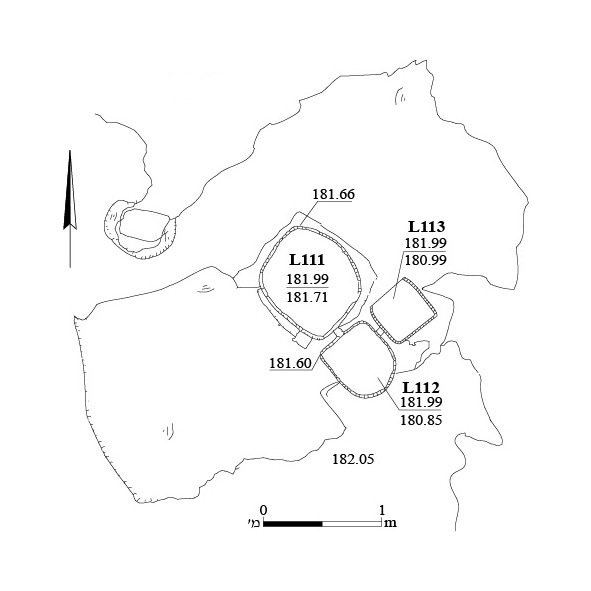 It is impossible to determine when the numerous cupmarks were hewn, but one can reasonably assume that they were used alongside the other agricultural installations in the area. ʽAd U. 2011. Modiʽin, Khirbat Abu Fureij (Northwest). HA-ESI 123. Avner R. and Shabi T. 2013. Modiʽin. HA-ESI 125. Krispin S. 2015. Modiʽin. HA-ESI 127. Toueg R. 2016. Modiʽin, Trig. Point Z-184. HA-ESI 128.
van den Brink E.C.M. 2005. Modiʽin. HA-ESI 117. 4. 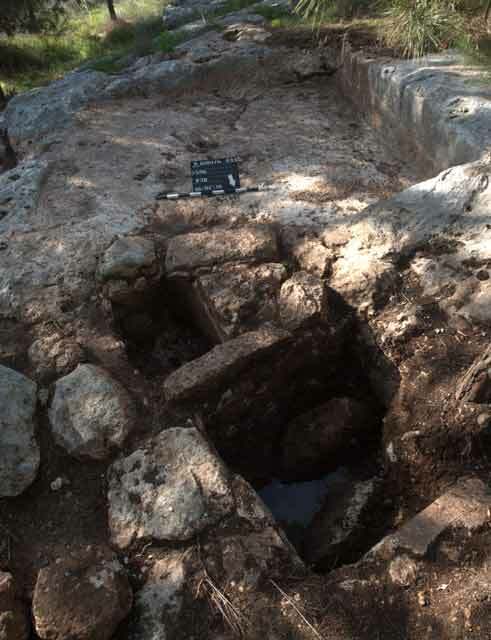 Winepress 14, looking northeast. 6. Winepress 25, looking southwest. 8. Winepress 58, plan and section. 9. Winepress 58, looking south. 10. 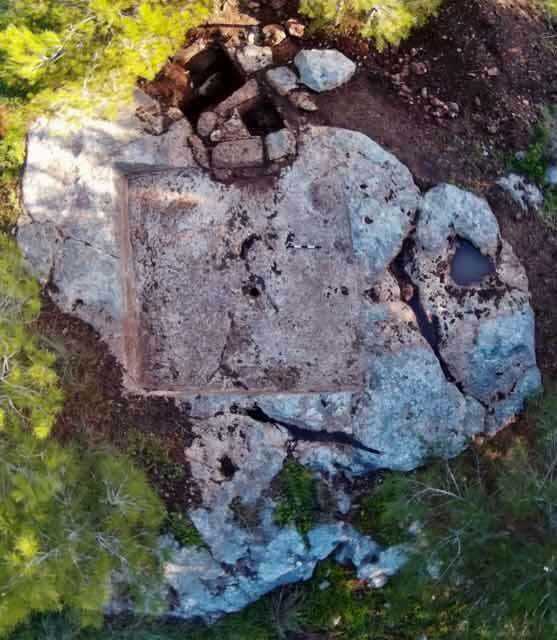 Winepress 58, aerial view, looking north. 12. Bodeda 40, looking south. 14. Cistern 4, looking east. 15. Cistern 34, looking east. 16. The shaft of Cave 11, view from above. 17. Cave 11, looking northeast. 18. Field Tower 9, looking northeast. 19. Wall 26, looking south. 20. Crushing Basin 60, looking west. 21. Cupmark 19, looking west.